I ended up allergic to the medication that had been making such a difference in managing the pain recently and allowing me to do so much crafting. Quiting that messed up everything. I’ve pretty much spent the week in bed with short forays out for class, physical therapy, and a few for trying to complete the rabbit hutch that’s been a work in progress for a few weeks now. The good news is that Mike, my physical therapist, has been working extra hard, and I’m starting to find my feet again. I can’t wait to have the rabbit hutch done. Removable poop trays with machine washable liners and removable, hose-able cages will be a real improvement over the current situation. 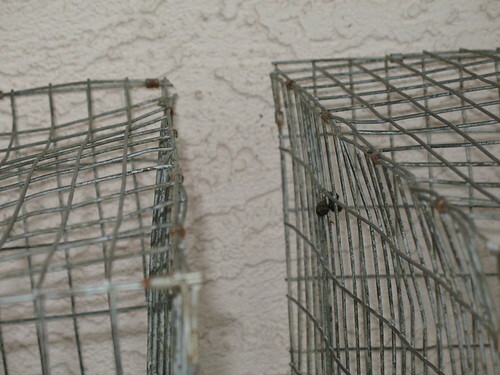 Since the rabbits came quite unexpectedly (I was thinking August), they’ve been living in their cages propped up on 2x4s to allow waste to fall through to the concrete below. I’m very sick of scrubbing concrete. The bunnies can’t even keep their mess under control though. Somehow, Jessica managed to do this to the top corner of her cage. She’s the bunny with attitude and some odd ways of showing it, but poop on the ceiling? I don’t even know how she managed it. That’s 18 inches above the floor of her cage. 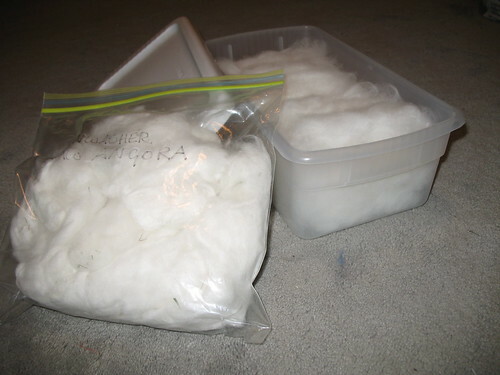 As I couldn’t sleep over the past couple nights, I’ve spent time preparing the raw wool. 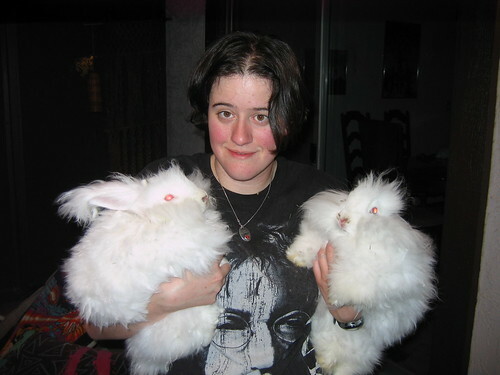 Friday night, I took a stripping comb to the bunnies and fluffed out the shedding undercoat. They’re cooler in the summer heat and I’ve got tons of wool. What a deal. Here’s what the wool collection looks like after two weeks of bunny ownership. All the wool in the box is cleaned and carded with an average staple length of over 4 inches and virtually no guard hairs. In addition to prepping the wool, I’ve been looking into other ways to use it. There is no way I can possibly needle felt this much angora as fast as my rabbits produce it. I grabbed a couple of wooden toy wheels and dowels to make drop spindles and experimented with using them the past few nights. Here’s what I’ve got. 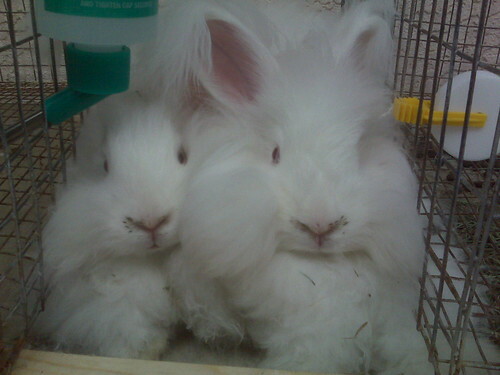 The white is 100% angora from my own rabbits. 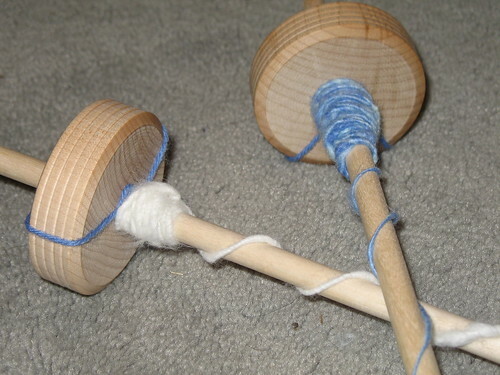 It breaks if you aren’t careful while spinning, but the finished product is quite sturdy and intensely fluffy. The purple/green fluff is acrylic. I recycled old yarn scraps of purple and mint green Red Heart yarn (the really cheap stuff) and carded the 3-5 inch long scraps into fluff and started spinning it. I’m amazed at how nice it looks. Talk about a trash to treasure story! 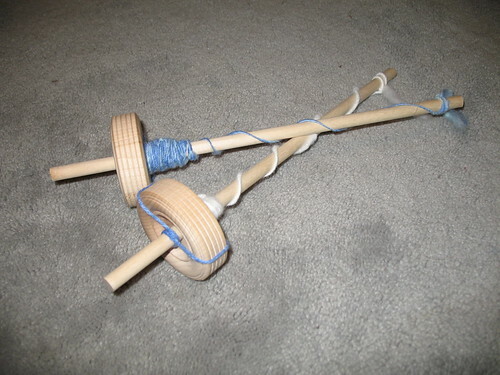 As for the spindles, if you catch a sale at Hobby Lobby, you can make 4 spindles for $2.50. Not bad at all. I learned how to use them from a YouTube video. Many people use cup hooks on top, but one video I saw suggested using a half hitch knot at the top. It’s more economical to not buy cup hooks, so naturally my spindles are hook free. As for me, I’m off to do the reading for my psych class. These first few chapters have been quite dull. The history of psychological assesment and theoretical perspectives are quite lame as I’ve had to cover those in high school psych, general psych, and developmental psych. Seriously, by the time you hit abnormal why can’t they just assume you know it and not require homework over those sections in the book? Tonight I get to finally start in on mood disorders. Way more fun than the general foundation stuff. I’d been trying to get an angora rabbit as a fiber producer for what seems like forever, and last night, not one, but two little bunnies came home with me. They are gorgeous little rew English angoras. 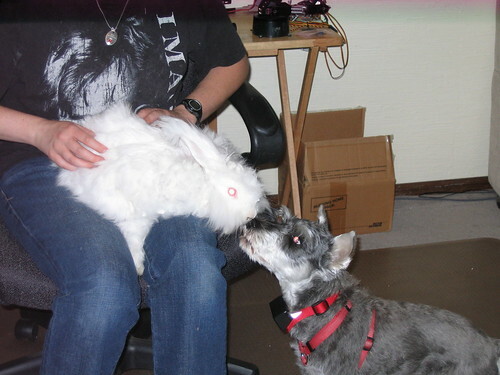 I meant to get one, but I’d been harassed by friends that bunnies also need friends. I’d picked out and paid for the first rabbit, Jessica, and didn’t want her or the sister she’d be leaving behind to be too depressed, so her sister Charlotte also came along. They’re only 8 months old and quite full of fluff. They’ve got to get a haircut to keep from overheating in the summer weather. The rabbit hutch still isn’t done, but they’re here! I’ve been loving and brushing the sisters and contemplating what their new names ought to be. Even Sketcher is learning to get along with his new family. So far, Charlotte is a bit more friendly, loves being held, and is quite a voracious eater when it comes to just about everything. Jessica is a bit bigger and fluffier. She requires more brushing at this point and although she tries to get away when you scoop her up, she settles onto your lap for some love. She’s a very picky eater and Charlotte is happy to nibble anything Jess doesn’t quite deem edible.